Start small, grow to millions. jBilling's scalable design lets you deploy at a level that's right for your needs. Whether you're a budding startup with a single server, or a fast growing company with increasing billing throughput needs, jBilling lets you start small and simple, and evolve as you need to. With time, you can enhance performance to match your growing customer base. jBilling scales by adding more servers to a cluster of billing nodes that act as your billing system, with each node supporting payment processing, invoice generation, web server, etc. In this scenario, everything runs in the same physical server. In this situation, the database runs in its own server, with the batch processes in an additional dedicated server. 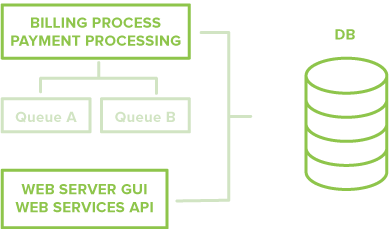 This leaves the run-time requests for serving the GUI (graphical user interface) and web-services in their own server. Here, we see six servers running jBilling, plus a cluster for the database. 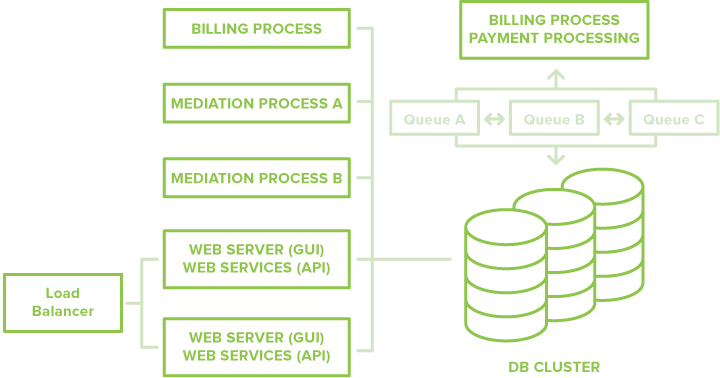 Heavy processes are distributed over one or more servers: two for mediation, and one for payment processing, which is sending payment requests asynchronously through three message queues.